A Winterized Mountain Bike with Studded Snow Tire OR an Awesome SNOW BIKE with the Fat Tire with a Average Width of 3.7 to 4.0 Inches. Note the Normal Mountain Bike Tire is 2.0 to 2.5 Inches – so with a Snow Bike there is greater traction and floatation in the most snow conditions. There are several options in the Greater Jackson Hole area for riding a BIKE from the Trails in the Cache Creek Area to the Local Groomed Snowmobile Trails to the Snow Packed Roads on the National Elk Refuge and in Grand Teton National Park. 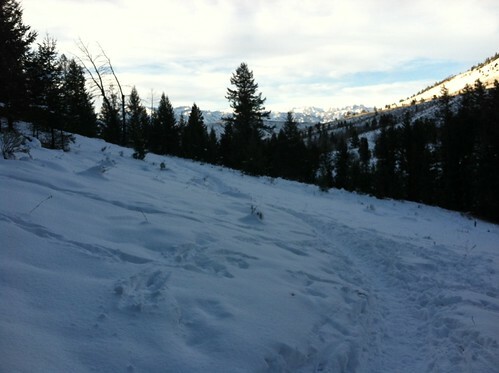 So try a NEW Activity – Winter Biking in Jackson Hole – A Novel an Fun Experience! Contact Teton Mountain Bike Tours @ 307-733-0712 or info@tetonmtbike.com for more details.